Jack in the Box is a quick-serve industry leader with 2000 restaurants, an appealing brand icon, creative advertising, and a unique menu. A few years ago the company was positioned for growth, but needed something more—it needed employees that were deeply aligned with the brand, who were willing to “own” guest satisfaction and deliver the highest levels of quality and service. And the company wanted the advantages that come from increased retention of good performers in a high-turnover industry. Using Metrus Group’s ACE model, Jack began with some serious introspection. They already had a dose of feedback from their guests. But what was going on internally that connected to these important stakeholders? Jack commissioned Metrus to begin a programmatic effort to assess and track Alignment, Capabilities, and Engagement in the context of their unique strategy to find out if improvements in ACE could help them improve guests ratings, visits and spend, and hence their financial performance. 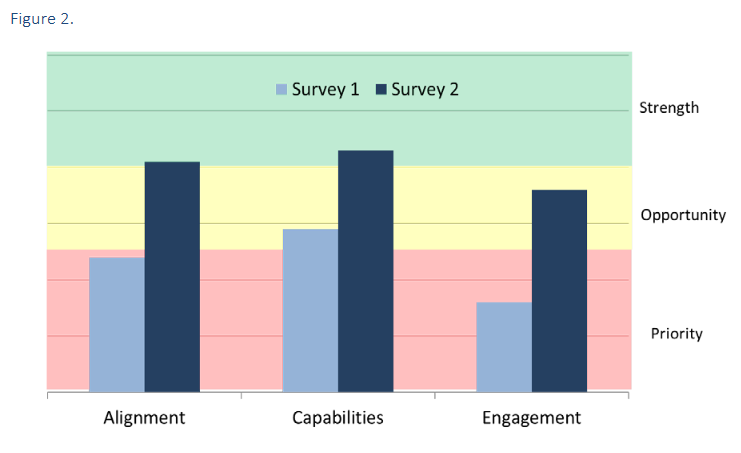 Engagement varied greatly across restaurants. Why? Different drivers of Engagement were strangling higher performance: supervisory behaviors, some corporate policies, and initiative overload among others. One of the “aha’s” that Jack observed is that despite uniform hiring, pay, training, on-boarding, performance management and other HR systems, business performance varied greatly across their restaurants. 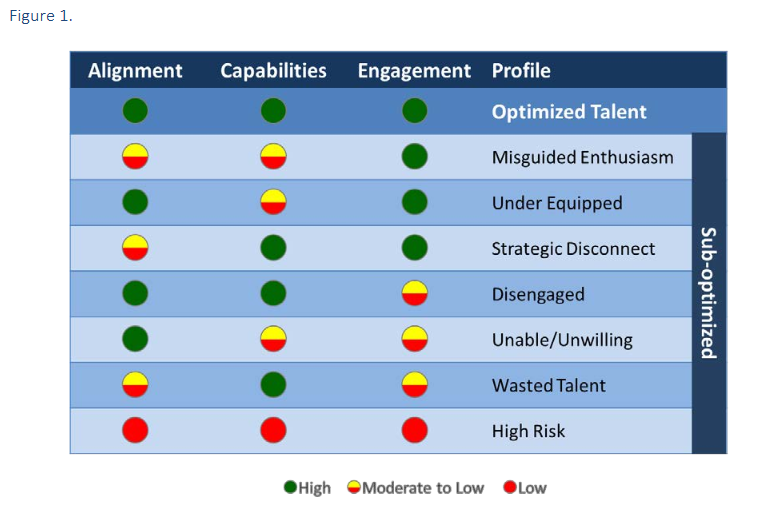 They looked at the various combinations of high or low Alignment, Capabilities, and Engagement (see Figure 1), and realized that they had examples of nearly every type of profile across their restaurants—very low and very high Engagement, Alignment, and Capabilities but not always in the same configuration. They quickly learned that one-size-fits-all fixes (e.g., alignment training for everyone or performance coaching) would be both costly and ineffective for those who were already high on a particular dimension (e.g., engagement). Instead, varying actions (e.g., coaching, training, process adjustments, resource adjustments) would need to be taken to improve a unit that was not high in ACE. Jack responded with swift action. Within a little over six months, follow-up actions got 90% of the low-scoring restaurants out of the ‘red’ (Figure 2). They also took corporate actions to begin streamlining communication, upgrading managerial people skills, setting new accountability levels and increasing brand clarity. Having the right diagnostic information was crucial in helping the company identify the true ‘root causes’ of low scores, allowing leadership to focus improvements. Jack in the Box continued the partnership with Metrus to statistically look at the service-profit chain—their model at the time for connecting people, service, customers and profit. The findings validated the effort put into ACE improvements (see Figure 3). A, C, and E were shown to be highly related to employee turnover, productivity, complaints and revenue. Statistical modeling revealed that while all three ACE factors predicted guest satisfaction, the Capabilities factor had the greatest relative importance. Understanding the greatest point of leverage is critical, since guest complaints were one third lower in triple green locations with the “optimized talent” ACE profile compared to those in triple red locations with the “high risk” profile. Further analysis pinpointed access to training as a key driver of capabilities – managers who limited crew training to save time, were impacting guest satisfaction as less trained crew made more mistakes. Frustrated employees were also more likely to quit, as no one likes doing a job poorly. Furthermore, by ‘getting the red out’ —moving units out of the high risk profile—the analysis showed a significant increase in revenue and profit. 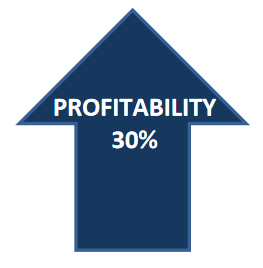 Profits were an astounding 30% higher at the triple-green, optimized talent locations. Turnover—one of the biggest costs in this labor intensive industry – was 21% lower in high ACE locations than their ACE-impoverished counterparts. For hard-pressed restaurant managers, less time spent on talent acquisition and training, means more time available for effectively running the operation. On the intangible side, it means more brand clarity to guests and employees alike, more cooperation and alignment across functions. Jack in the Box continues to grow and is an attractive franchise investment. Jack in the Box was named the HRM Impact Award winner in recognition of this work in creatively and effectively using evidence-based measurement and management to drive business success. Learn more.